The entrance to Pacific Region Compost on Camp Adair Road. There was no unpleasant smell at mid-day Thursday. 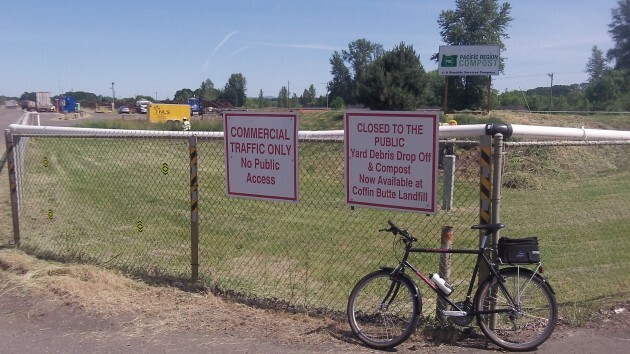 If you live within a few miles of Republic Services’ Coffin Butte Landfill and Pacific Region Compost, you occasionally know they’re not far away because of the odor. That’s an issue that came up briefly before the Albany City Council this week but didn’t get explored. Republic Services’ Kevin Hines and Julie Jackson were at the council’s Monday work session to explain why callers to their Albany office were kept on hold longer than the company considers acceptable. The gist of it was that their experienced customer service employees had been shifted to other jobs within the company because by some time in 2017, their customer service jobs will disappear. The jobs will be gone because Republic Services is setting up regional call centers, and the one for the mid-valley will be in Phoenix, Ariz. They’ve hired short-term replacements to take calls until the call-center switch is made. And while those new employees are improving, they’re not yet up to speed. So, when you call what used to be Albany-Lebanon Sanitation, be prepared to be on hold for a while. Republic’s compost operation on Camp Adair Road also handles food waste, though not from Albany residences since the council turned down that option some time ago. I don’t know whether food waste makes composting a smellier thing than it otherwise would be. A month or so, The yard waste cart driver dumped a portion of my and a neighbors cart on the ground. I tried calling customer service twice, hanging up after about 8 minutes of being on hold each time, with no indication of when my call might be answered. I took a couple pics and posted them on their Facebook page. I had an email from them within 10 minutes. Another issue I see with them is their refusal to accept cash to pay your bill. People without a bank account have to buy a money order. Apparently Republic doesn’t trust their own employees to handle cash. Being raised on a farm may have given my olfactory senses a different means of calculating odors. The large piles of animal waste that accumulated on the farm were spread every spring and one year a neighbor’s wife, a “city girl” complained to her husband. His reply was, “It smells like money to me.” It didn’t cost near what commercial fertilizer costs. Check with your Master Gardeners and they will tell you that good compost should not have an unpleasant odor! I have composted for a number of years and found that if turned and stirred once a week all you get is a pleasant odor. With the quantity of debris Republic is handling it would be almost impossible to turn all of it each week. Another “smelly” subject: Coming home Sunday evening on Salem Road there was an odor which I assume is coming from Talking Water Gardens. It smelled like sewage. HH, thanks for the follow up in form of postscript! Good on them for trying something. To me it may not be needed as these “smells” don’t bother me but may bother others. What does strike me the comment that it is “costing a lot”. Trickle down economics happens. Companies will pass this cost along to us “the consumers” sooner or later. Now that is trickle down. Not quite how St. Ronnie sold it but …..